18% of the population will experience clinical depression at least once in their lives. According to WHO, depression is expected to become one of the top causes of disability worldwide by 2020. Depression can be addressed, without the need for potentially dangerous drugs, through regular exercise. Studies show exercise is as effective as antidepressants for moderate depression, without potential side effects. 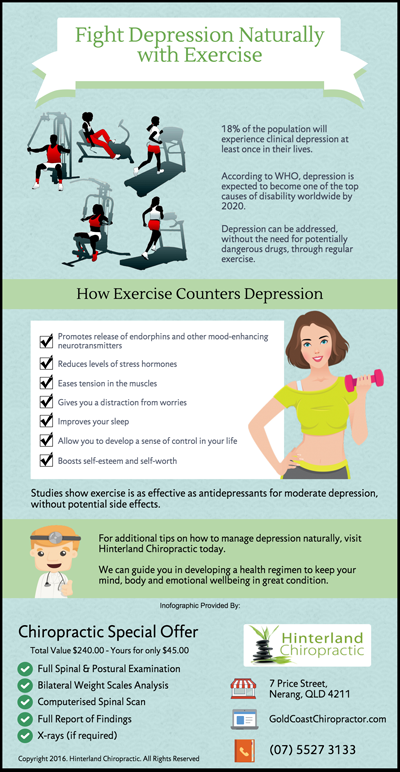 For additional tips on how to manage depression naturally, visit Hinterland Chiropractic today. We can guide you in developing a health regimen to keep your mind, body and emotional wellbeing in great condition. Call us on (07) 5527 3133.